Citroën is launching an unprecedented offensive in SUVs in 2017, with the reveal of two new vehicles. Following the unveiling of C5 AIRCROSS SUV at the Shanghai Motor Show, Citroën C3 AIRCROSS is now stepping into the spotlight! This second, more compact SUV, will launch in Europe in Autumn 2017. Inspired by the C-Aircross concept revealed in early 2017, Citroën C3 AIRCROSS continues the brand's SUV offensive. Naturally distinctive, its unique styling combines originality with robust strength, reflecting Citroën's DNA and the fundamentals of SUV design. Watch the video to discover more. Citroën C3 AIRCROSS SUV stands apart in the world of SUVs with its fresh, powerful and original attitude. Dominate the road with this SUV! With its raised clearance, large wheels and Grip Control with Hill Descent Assist, Citroën C3 AIRCROSS SUV is ready to take on all types of terrain. At ease in the city and on the open road, C3 AIRCROSS SUV makes everyday life easier. In the city, Park Assist technology makes light work of parking manœuvres. With its tall, ingenious layout, Citroën C3 AIRCROSS SUV combines class leading interior space with exceptional comfort: 5 seats with generous leg and head room. The exceptionally spacious boot has a capacity of 410 litres, which can be increased to 520 litres with the 2/3-1/3 rear bench. For full modularity, as an option, the front passenger seat can be folded to increase the load length to 2.4 metres. C3 AIRCROSS SUV strikes an original stance in this segment, with the muscular lines of its bonnet, which is both short and high. It conveys an impression of robust strength, with a light signature that attracts the eye at both front and rear. At the same time, it is non-aggressive, with its horizontal balance and generous contours. This SUV features Citroën's graphic signature using two tiered lights. These lights showcase the expressive front end and a light signature reflecting the identity of the brand new models. At the rear, the strong shoulders of C3 AIRCROSS SUV underline its width and strength of character. 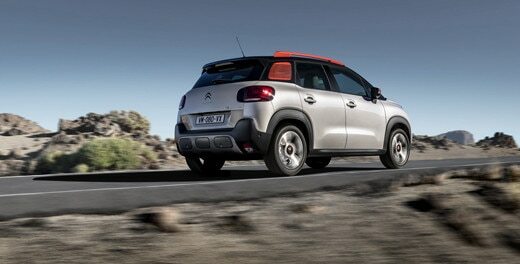 The 3D-effect rear lights bear a familiar resemblance with C3 and C-Aircross concept car. A true SUV, C3 AIRCROSS features wheel arches with extended wings and self-coloured lower sill panels for protection from minor impacts. WITH 40 COMBINATIONS: GO FOR COLOUR! With eight body colours, three roof colours and four Colour Packs, Citroën C3 AIRCROSS SUV adapts to your personal taste. 40 combinations are available! Faithful to the Brand's DNA and our Citroën Advanced Comfort® programme, C3 AIRCROSS SUV benefits from all of Citroën's know-how and provides drivers and passengers with unrivalled travelling comfort. 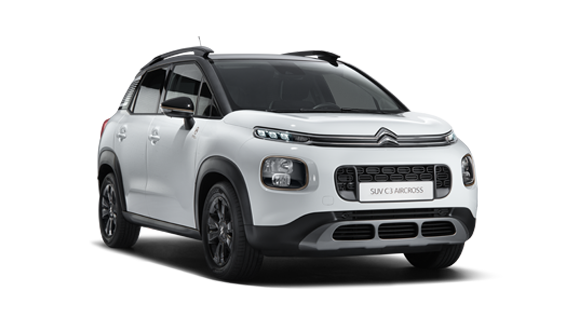 Limits on passenger luggage are a thing of the past, C3 Aircross SUV has the largest boot in the segment. Hype Colorado ambiance expresses a premium approach, enhanced by soft-touch materials and special, Colorado coloured upholstery which is found on the half-leather seats. A Colorado coloured two-tone steering wheel and dashboard complement this unique design, creating an all-encompassing feeling of comfort and well-being. Metropolitan Grey ambiance emphasises the cabin space by surrounding you with bright colours and warm materials on the seats and dashboard – it’s a balance of comfort and contrast. Urban Red ambiance expresses vitality and gives C3 Aircross the technological character of an SUV. It brings a rich mix of dark colours with dramatic red touches on the seats. C3 Aircross SUV standard ambiance creates a neutral calmness through the use of its grey textured dashboard, Mica Grey cloth seat trim and accents of vibrant yellow stitching. You can now configure and reserve your C3 Aircross SUV online. Personalise your Citroën C3 Aircross SUV with preferred colour, trim and engine and then save to view next steps. Two intuitive electric buttons let the driver reveal the glass roof or adjust the blind in order to regulate the level of brightness inside the cabin. Citroën C3 AIRCROSS SUV features intuitive connectivity. The central console features a dedicated storage compartment for wireless smartphone charging. Compatible smartphone apps are also accessible from the 7" touch screen through the Mirror Screen function, with Apple CarPlay and Android Auto. Equally at ease in the city or on the open road, Citroën C3 AIRCROSS SUV is convenient for everyday use, and easy to park, with its reversing camera and sensors. Park Assist technology supports parking manoeuvres, making light work of parallel parking or parking at an angle. This function switches between high and low beam depending on traffic, when it detects other vehicles. Driving at night is safer, you can fully concentrate on driving. Equipped with Grip Control® for improved traction and special 16-inch and 17-inch mud-and-snow tyres, C3 Aircross SUV offers a highly modular drive and adapts to all types of roads, whatever the condition and surface. Combined with Grip Control®, the Hill Descent Assist function maintains the car at a reduced speed even on steep inclines. This technology keeps C3 Aircross SUV on the right trajectory while limiting the risk of slippage as the car descends a slope. A wide range of new-generation efficient, economical engines combine advanced technology with a promise to take you away from it all. This SUV is available with the 2018 International award winning 110hp and 130hp PureTech petrol engine as well as the PureTech 82hp and the BlueHDi diesel engines (100 and 120). An EAT6 automatic gearbox linked to the Stop & Start function is available with the PureTech 110 petrol engine while the PureTech 130 petrol engine and BlueHDi 120 diesel engine ship with a 6-speed manual gearbox. 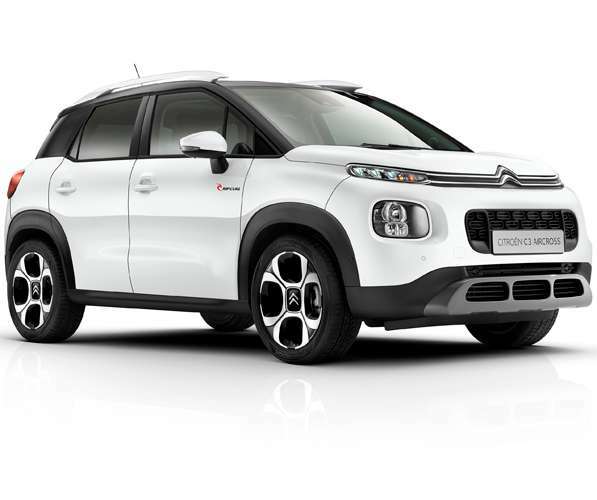 Citroën C3 Aircross SUVs robust and bold design has been brilliantly represented in 5, 1/64 scale miniature models and 2, 1/43 scale models. With colours ranging from Spicy Orange, Soft Sand and Breathing Blue you can purchase the perfect miniature C3 Aircross SUV for your collection.